MANILA, Philippines - President Rodrigo Duterte was spotted wearing a brogue-style leather boots handcrafted by a 68-year-old shoemaker from Marikina City during his meeting with US Secretary of State John Kerry on Wednesday, July 27. 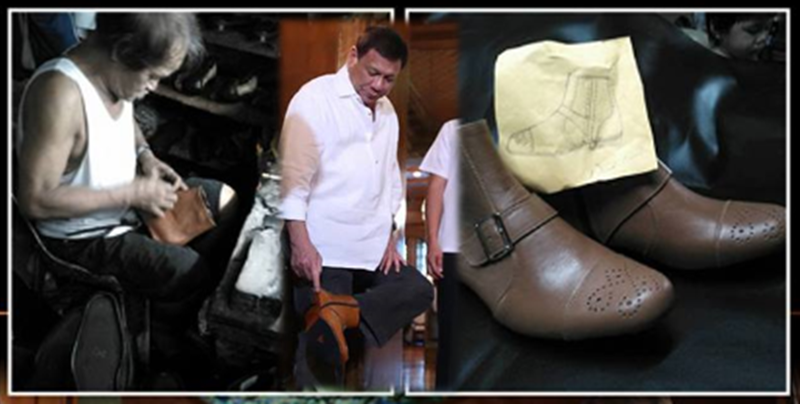 Duterte proudly showed the pair of custom-designed shoes which was a labor of love by talented shoe artisan Rolando de Guzman Santos to several Cabinet members. The pair of shoes was Santos’ way of honoring the 71-year-old politician for his humility, boldness and authenticity. Determined to fulfill her father’s dream to have Duterte wear the shoes he made, Santos’ daughter Rosemarie shared photos of her father making the shoes on her Facebook account. "[G]agawin ko lahat ng mkakaya ko para matupad yung pangarap kong karangalan para sayo.. na isang araw maisusuot ng isang presidente ang sapatos na gnawa mo ng buong puso,” Rosemarie wrote. Rosemarie eventually contacted Boni Adaza of Davao City's Chardin Fashion House, which designs barongs for the president. The pair of shoes reached Adaza’s team on June 28, two days prior to the inauguration and was immediately shown to the president. However, Adaza’s team decided not to pair the shoes with Duterte’s inaugural attire as the caramel color of the shoes did not suit the black pants they made for the president. Moreover, the shoes also needed a stopper to prevent slipping. On the day of the inauguration, Duterte was seen donning a pair of beige pants but the president wasn’t wearing the shoes made by Santos. Barely a month later, Duterte, known for his simple fashion style, decided to showcase the Marikina-made shoes.